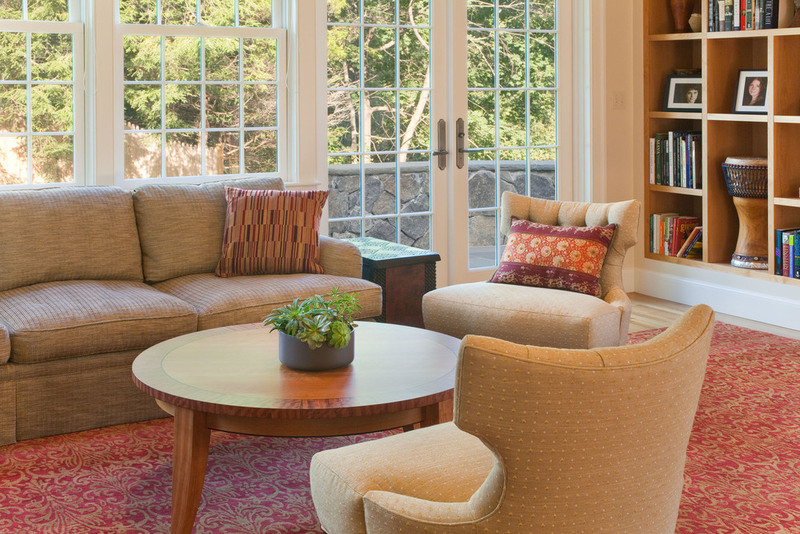 This Colonial Revival home sits on a wooded hillside lot with views to Boston. The owners are music lovers and performers, and host musical gatherings in connection with their central role in the Boston music scene. The additions were designed to be highly sympathetic to the original architectural language, and include a concert quality conservatory space that was carefully designed to blend with the existing spaces. In the 1990's, D. W. Arthur Associates renovated the kitchen and added a gathering room for this home for a growing family. More recently, a design was created to reconfigure most of the home's interior and to add a new wing on either end of the central volume. 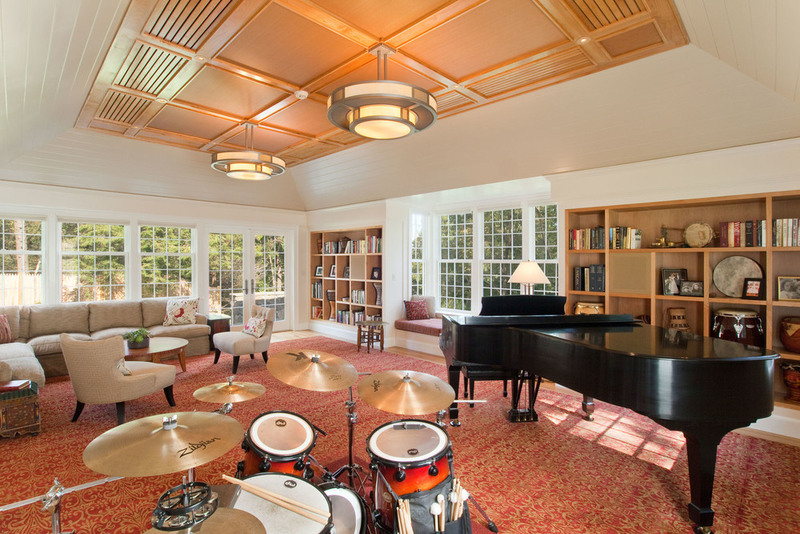 On the east end, a new 2 story volume accommodates a large music conservatory. The lower level includes new guest living quarters with generous windows which take advantage of the sloping site to provide daylight and views. Balancing this mass is a replacement garage on the west end, reinforcing the centrality of the main symmetrical house volume. Careful integration of the new conservatory with the original house was a primary design focus. The owners frequently host live musical performances with 50 people or more in attendance. They also regularly play piano and drums themselves, or with smaller ensembles. Therefore, considerable attention was paid to the scale and proportion of this addition so that it could accommodate the larger groups, but be intimate enough to be integral to the family home. Ultimately, the conservatory was situated in careful relationship to the living room, and both spaces opened to one another in a calibrated way, allowing the rooms to work both individually and as a cohesive whole for larger audiences. Equally important was the acoustical performance of the conservatory. The room has seen world renowned musicians perform since it opened. It has been rewarding for both the owners and architects to hear that they have been very pleased with the acoustical properties. The design of the space embodies thoughtful proportioning of components and includes careful integration of systems so as to optimize enjoyment of both live and recorded music. Detailing, finish systems and materials were all carefully selected and choreographed for absorptive properties to create an acoustically live but not echoic environment. Additionally, strategies for air conditioning and circulation were adapted from larger concert halls, including large supply and return conduits and diffusers to allow for very slow air movement and isolated machinery. The owners enjoy entertaining outdoors as well as indoors, and the architectural design (closely coordinated with a landscape designer) optimized connections to the patios, gardens, and ultimately a stand of woods and open field. A belvedere expands the conservatory into the gardens, and provides an overlook above the extended landscape. The entire house was essentially reconfigured to provide a new eat-in kitchen, larger dining room, new master suite and upstairs bedrooms, etc.